In June 1900, the Chicago City Council authorized extensions in the Garfield Park and Douglas Park branches of the Metropolitan Elevated Railroad to 52nd and 40th Avenues, respectively. Service was extended to 40th Avenue on June 16, 1902 following extension of service to Lawndale (3700W) on March 10. 40th Avenue (changed to "Crawford Avenue" in 1913 and finally changed to "Pulaski Road" in 1933) served as the terminal for the Douglas Park branch until 1907 when the line was finally extended to 46th Avenue at the city limits. The 40th Avenue terminal included an elevated storage yard at track level. The track layout consisted of three tracks approaching the station, splitting into a loop track that encircled 11 east-west storage tracks in the middle. A three-track maintenance shop was situated at track level in the north half of the yard and the loop track had two side platforms. Trains terminating at 40th Avenue operated around the loop in a counterclockwise direction, dropping off alighting passengers at a platform int he north half of the yard, circling behind the shop, and then picking up inbound passengers at the platform on the south half of the loop. When 40th Avenue became through station in 1907, the loop track was broken in half as the tracks were extended west through the yard and beyond the station. The extension was achieved by tacking three of the yard tracks and repurposing them: tracks 5 and 7, which lined up with the inbound and outbound route tracks, were extended through the loop track and beyond to the city limits. Track 6, in between, was removed altogether and replaced with an island platform for trains continuing west. Interestingly, the remaining tracks were never renumbered, so there remained three track numbers missing between the north yard (tracks 1 through 4) and south yard (tracks 8 through 11) until the yard closed. An interlocking tower was also added at the east end of the island platform to control access in and out of the yard. Pulaski Yard remained in service into the CTA. Although the opening of a yard at 54th by the 1920s had decreased the number of trains stored there, the route's only maintenance shop remained at Pulaski. However, the discontinuance of beginning and ending Douglas trips at Lawndale on December 9, 1951 further decreased the need for a mid-route yard. 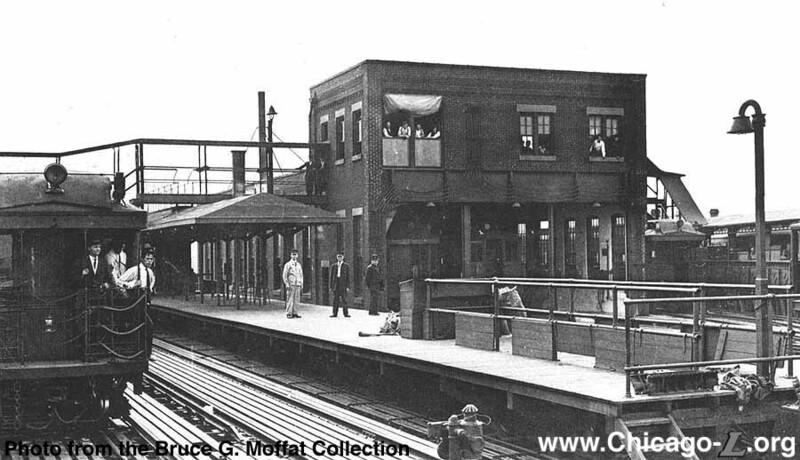 On December 13, 1953, the new Douglas Park transportation office, an elevated structure located over the platforms at the Cicero-Berwyn Terminal, were officially opened. Train crews and agents began reporting at the new terminal with the midnight run on that date. At the same time, the offices of the Station Superintendent and Receiver at the Pulaski Yard terminal were permanently closed. Pulaski Yard Tower was removed from service on April 3, 1962. The yard was closed around the same time and was subsequently demolished, with all car storage moved to 54th Yard at the end of the line. With only a maintenance pit available at 54th, more substantial car maintenance was performed at Desplaines Shops and Logan Square Shops (later replaced by Foster Shops, then Rosemont Shops).